Last week was a pretty slow week. I was out of town for the weekend and got back this evening. 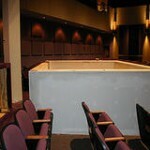 I headed over to the church to find our team working hard on finishing the cable pulls to FOH. I also found our exisiting FOH pretty much completely dismantled. There’s no turning back now. I just got out of there after helping pull pretty much every cable we’ll ever need to FOH…I hope. The pipe is pretty full now. A lot of boxes of new gear started arriving today. This week some of the CPM folks are on hand to start putting their stuff together for us. 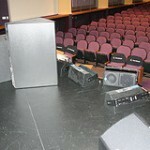 Meanwhile our team will be focused on getting the new FOH up and running for this weekend. We have one more week until the new system gets premiered, but in the meantime we still have to make something work for Sunday. I’ll try and snap pictures this week of the completed FOH and whatever other madness is going on.